Read the passages slowly. Write out the verses you want to remember. Write how God spoke to you through the passages. Jot down your observation and reflection in the verses. Although some scholars today have questioned Pauline authorship of 2 Thessalonians, the unanimous testimony of the early church fathers supports Pauline authorship. The main reasons given by those who question Pauline authorship include: (1) The eschatology of 2 Thessalonians is regarded as different from that of 1 Thessalonians. Specifically, the sudden/imminent expectation of Christ’s return in 1 Thessalonians 4:13–5:11 is said to be inconsistent with the requirement in 2 Thessalonians 2:1–12 that specific signs must first take place. 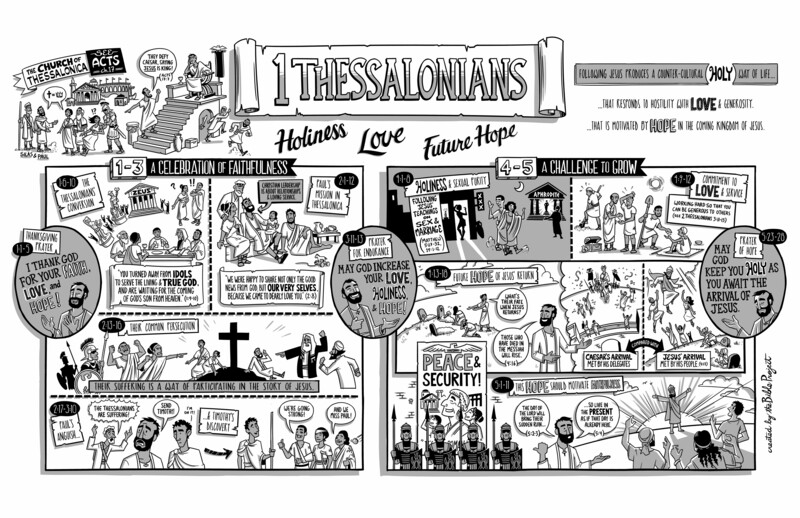 (2) The many commonalities between 1 and 2 Thessalonians are alleged to reflect literary dependence, which is regarded as inconsistent with Paul’s authorship of both. (3) Second Thessalonians supposedly has a colder tone than 1 Thessalonians. (4) Second Thessalonians 2:2 and 3:17 are thought to make best sense if written by a pseudonymous author. A careful evaluation of these objections, however, supports the conclusion that Paul was in fact the writer of 2 Thessalonians. The duplicity entailed in the forgery hypothesis (see 3:17) is hardly credible. In addition, the above objections can be readily refuted: (1) Both letters portray the second coming as an unwelcome and sudden surprise for unbelievers (1 Thess. 5:2–3; 2 Thess. 2:8–12) but an anticipated and welcome event for those who are in Christ (1 Thess. 5:4–8; 2 Thess. 1:6–10; 2:13–17). Moreover, certain events precede the Lord’s return in 1 Thessalonians 5:3 as well as 2 Thessalonians 2:3–4, 9–10, and imminence can be seen both in 1 Thessalonians 4:15–17 and in 2 Thessalonians 1:7, 10; 2:1. A sudden and imminent eschaton was regarded as compatible with signs in Jewish and early Christian writings (e.g., Matthew 24–25). (2) Paul probably wrote 2 Thessalonians shortly after 1 Thessalonians, and may have referred to a copy of it. (3) The idea of a colder tone in 2 Thessalonians is exaggerated (see Literary Features). (4) Second Thessalonians 2:2 and 3:17 probably reflect Paul’s concern that a forged letter may once have existed. If you read this letter hard on the heels of 1 Thessalonians, you may notice that in general it lacks the warmth of feeling that you found in the first letter; and the material in 2 Thessalonians 2:1-12 is just obscure enough, especially in light of 1 Thessalonians 4:13-5:11, to cause you to wonder what gives. But what has caused the tone of this letter is easy to see. Both of the major items taken up (2 Thess 2:1-12; 3:6-15) give good reason for Paul to be upset—even more than he actually comes across as. In any case, the other sections of the letter (the thanksgiving and prayer in 1:3-12 and the prayer and request for prayer in 2:16-3:5) are full of the same kind of affection and concern Paul expresses in the earlier letter. So what does give? First, Paul has learned from someone that the church is being thrown into confusion (2:2) by a declaration given in Paul’s name that the day of the Lord has already happened. Both sides of this matter are enough to upset him—the falsehood itself and the fact that it is being put forward under Paul’s authority. Since in 2:15 he tells them to hold fast to what he himself had taught them—by “word of mouth” (when he was present with them) and by “letter” (1 Thessalonians)—the problem in 2 Thessalonians 2:2 probably comes from an untested prophetic utterance (see 1 Thess 5:19-22) claiming to speak in Paul’s name on this matter. Second, he also has reason to be a bit miffed over those who are idle and disruptive, since he has already spoken to this issue in his first letter (1 Thess 4:9-12; 5:14). Together these account both for the ambivalent tone and the specific content of the letter. ESV: Study Bible : English Standard Version. Wheaton, Ill: Crossway Bibles, 2008. 2313. Fee, Gordon D, and Douglas K. Stuart. How to Read the Bible Book by Book: A Guided Tour. Grand Rapids, Mich: Zondervan, 2002. 369-370. 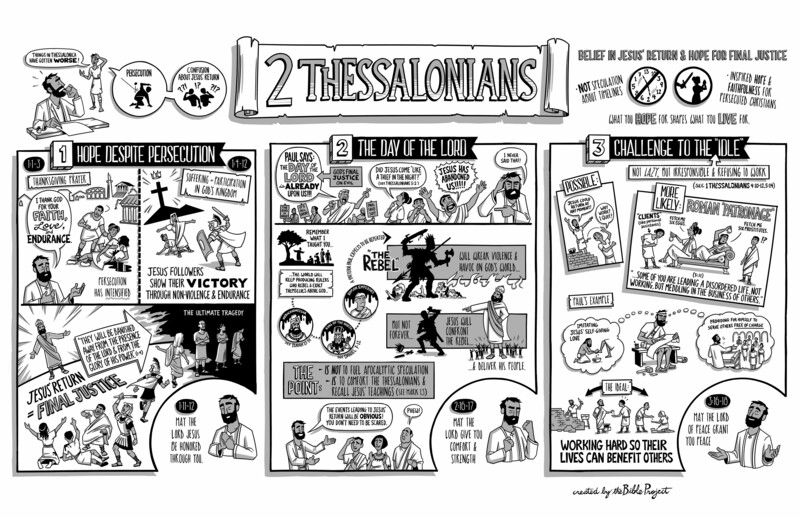 Click HERE for the commentary and Bible Project sketch notes for the Book of 1 Thessalonians. Paul is widely regarded as the author of 1 Thessalonians, as evidenced by how compatible the vocabulary, style, and theology are with his other letters. The mention of Silas (“Silvanus”) and Timothy as co-senders (1:1) may indicate Paul’s care to present the missionaries as a united band in order to offset any Thessalonian disappointment that Paul had not come to visit them again but had sent Timothy instead (see 2:17–18; 3:1–2, 6, 11). So what would you have done? Try, as Paul did, to return, despite the danger (1 Thess 2:17-18)? And what if you could not return, because “Satan blocked [your] way”? And all the time you know nothing about what has happened in Thessalonica since you left (these were the days before postal service, not to mention telephone and e-mail service!). Very likely you would do what Paul did: Send a younger colleague, who could return without fear of being recognized or of suffering personal danger. Now Timothy has returned to Paul and Silas in Corinth. A full half of our letter (chs. 1-3) is about Paul’s past, present, and future relationship with these new converts, told in basically chronological fashion. Two clear things about Paul emerge in this section: (1) his deep, personal anxiety about the Thessalonians’ situation and (2) his equally deep relief to learn that things are going basically very well (you can almost hear his sigh of relief in 3:6-8). Two things also emerge about the Thessalonian believers in these two chapters: (1) They continue to undergo suffering and persecution, but (2) they are basically hanging in there with regard to their faith in Christ—although there are also some things lacking. 10 ESV: Study Bible : English Standard Version. Wheaton, Ill: Crossway Bibles, 2008. 2301. 11 Fee, Gordon D, and Douglas K. Stuart. How to Read the Bible Book by Book: A Guided Tour. Grand Rapids, Mich: Zondervan, 2002. 364-365. Click HERE for the commentary and Bible Project sketch notes for the Book of Colossians.